NEW YORK (CNNMoney) -- Problems in Japan have become exhibit A in what economists say is the greatest threat to the recovery in the United States -- uncertainty overseas. Still, Japan isn't even the biggest concern of an exclusive survey of top economists by CNNMoney. Those economists indicated that the spike in oil prices caused by political unrest in North Africa and the Middle East is the most serious threat Americans now face. But Japan is obviously a major worry. As Japanese officials struggle to deal with the human toll of the earthquake, tsunami and fears of a meltdown at nuclear reactors, economists and investors are scrambling to figure out exactly how big of an impact Japan will have on the U.S. 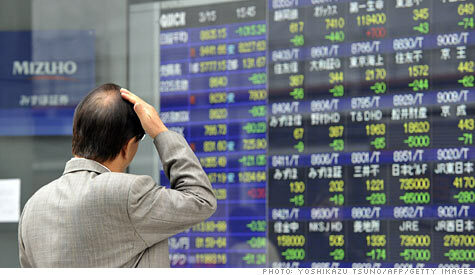 The crisis in Japan already has led to a big sell-off in U.S. stocks earlier this week. Joseph LaVorgna, chief U.S. economist with Deutsche Bank, said the drop in the stock market is a worry because of the damage it could do to both consumer and business confidence. LaVorgna said the big rally over the past two years has been "an important driver of the recovery." So a larger plunge in stocks could be "a serious problem." Fears about the situation in Japan also led to a flight-to-safety rally in Treasury bonds this week, which has pushed interest rates lower. Bond prices and yields move in opposite directions. But some economists said rates could quickly move higher if Japanese investors and insurers start dumping their massive holdings of U.S. government debt to pay for reconstruction efforts. The Federal Reserve is set to stop buying long-term Treasuries in June, meaning there will be a sudden loss of demand for government debt. That, combined with a possible sale of Treasuries by Japan, could push interest rates higher on many consumer and business loans. "Japan's a wealthy country and a lot of their wealth does reside abroad," said Scott Anderson, senior economist with Wells Fargo Securities. "It might not be today or tomorrow, but three to six months from now we could see a strong increase in yields." LaVorgna isn't expecting this scenario to play out though. He thinks that the Bank of Japan will keep buying U.S. debt in order to prevent Japan's currency, the yen, from rising too much versus the dollar. The yen hit an all-time high against the dollar Wednesday. A strong yen makes Japanese exports to the U.S. market less competitive. Fortunately, most economists believe that any disruption to the supply chains of U.S. manufacturers because of damaged factories in Japan may be temporary. But the uncertainty created by the disaster is what is most troubling. "It's not what we know that is scary, it's what we don't know," said Anderson. "That uncertainty is what's driving the market."